← What’s my voice again? This is only the second review in this series and I’m already breaking my own rules – Downbelow Station (aka The Company Wars) was first published in 1981, which is after 1980 insofar as our blinkered human perspective perceives time. I regret nothing, because Downbelow Station is terrific. As science fiction goes, Downbelow is right in my sweet spot. Like Gateway, the action centers on a human-controlled space station. Pell Station sits at the political fulcrum between the Earth Company, the solar-allied network of colonies and stations, and the Union, the human colonies out at the edges of human expansion. Complicating things, Pell is also home to the only intelligent aliens yet discovered – furry primates they call the Downers, who have easygoing attitudes and an uncomfortable cargo-cultish inclinations towards the human colonists. Naturally, political tensions brewing for decades between the old and new explode on Pell’s doorstep, dragging it out of its comfortable mercantile neutrality as both alliances fight to control their border with the other. The first few chapters start slowly as Pell becomes the unwilling host for several thousand refugees evacuated during the destruction of two other stations. The Pell Station government, led by the Konstantin clan, struggle to accommodate the refugees, maintain quarantine conditions and deal with the rapid breakdown in their systems and society. Much of the book is taken up with refugee crises and pragmatic problem-solving, hunts for saboteurs and black marketeers, and jealous station politics. Things heat up dramatically when Company and Union ships begin openly to fight for control of Pell. The last couple of hundred pages are like watching a clown juggle eggs, chainsaws and grenades while having a heart attack. It’s pretty exciting. The sequences told from the perspective of the Downer characters didn’t engage me as much. I spent the entire book in an odd state of premature disappointment that Cherryh was going to reveal a weird psychic spirituality that would turn the tide of events. Happily not – Cherryh keeps them grounded, though the Downers do get their moments in the sun. Cherryh leans heavily on a strangely fragmented prose style that occasionally loses its grip on structure and drifts off in unexpected directions. The first chapter is a comparatively lengthy prologue recounting the setting’s history of space exploration. Isn’t that a no-no these days? (Well maybe, but I found myself flipping back to the front of the book a few times to make sure I understood which faction was which). And the events of the first half, while dramatic, lack some of the peaks of excitement that the latter parts deliver. Downbelow Station feels like a very modern novel, which I suspect speaks highly of its critical influence on the genre. Both Babylon 5 and Deep Space Nine are obvious and acknowledged descendants. But beyond the trappings of its setting, the use of multiple viewpoint characters, the cold science fiction pragmatism of life on a space station, the abuse of executive power and the overtly political themes all feel like work being produced right now (the James S A Corey Expanse novels being one high-profile example). I doubt I’d have enjoyed this book as much if I’d read it ten or fifteen years ago – now I suspect I’m just angry enough to appreciate it. 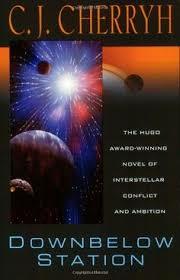 Vital stats: Published 1981; Awards: Hugo Best Novel (1982); Locus Best Science Fiction Novel (shortlisted, 1982). Appears a couple of times in Locus’ “Top 50 SF novels” lists, and fair enough too. This entry was posted in Visiting Classics and tagged babylon 5, c j cherryh, deep space nine, downbelow station, james s a corey, the expanse. Bookmark the permalink.